A library card is your ticket to reading, learning, knowledge, entertainment and experiences that open up your world and help you stay connected to the people, places and things that matter to you. It’s easy to get a library card - and it’s free. A library card is available to people of all ages. Children under the age of 18 may apply for a library card in person or a parent may apply for them. Printed check, utility bill or postmarked envelope. Hunting and fishing licenses are NOT acceptable. Your first library card is free. Replacements are $1 for adults; 50 cents for children. Special arrangements can be made to obtain cards for people with disabilities who cannot come to the library and for school groups getting cards as part of a tour. Call 236-5203. 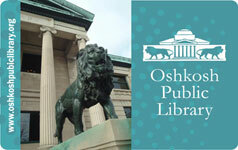 You can borrow items from any of the 30 libraries in the Winnefox Library System with an Oshkosh Public Library card. You are responsible for all items checked out on your card until it is reported lost or stolen. The library reserves the right to determine and limit each borrower's library privileges. A valid library card also allows you to renew and place holds on books and other items online, log on to Internet computers at the library and use the library's online resources from home or office. Fill out an application at the library's First Floor Customer Service Desk at 106 Washington Avenue. Library cards must be renewed every 16 months. 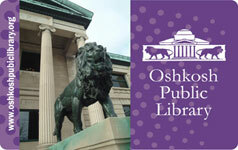 To keep your records up to date, please visit the library to renew your card or call 236-5203. To help keep track of your checkouts, holds and other activities, add your e-mail address to Your Account to receive notices when items are due, when holds are ready for pickup and when your card needs to be renewed. It's also easy to receive text notifications from the library. Keep up-to-date with your library account on your mobile phone using the library’s Shoutbomb text messaging service. Get texts when items are due, holds are ready to pick up and more. Sign up today!